Stainless Steel Focus was launched in September 1990. It is published monthly and provides news, comment, and analysis of both local and international stainless steel markets. Contents include company news and company profiles, market supply and demand, forecasts, prices, processing and processors, applications and users. Particular attention is paid to the raw materials markets – nickel, chrome and stainless steel scrap – which provide key insights into likely stainless steel market movements. Stainless Steel Focus is the only stainless steel publication that provides this vital data and analysis every month to senior management and key decision makers within companies active in the stainless steel industry in Europe, the Far East and the Americas. Stainless Steel Focus is the global leading provider of information and news for the stainless industry and combined with our web site www.stainless-steel-focus.com provides a complete media package for companies wishing to promote their products and services to a finely targeted worldwide audience. 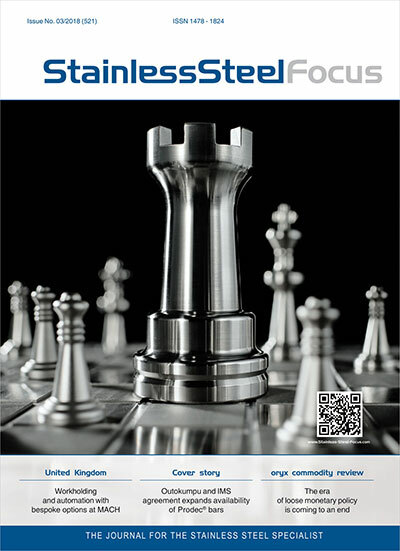 Stainless Steel Focus is published monthly, with an average circulation of 8,500 copies. Take advantage of our journal, which is targeted directly at your market, and market participants important to your company. Together with us, you have the opportunity to realise the potential available to your company offered by this consistently growing market. Would you like to promote your company in StainlessSteelFocus? We would be happy to provide you with a personalised quote for your campaign.